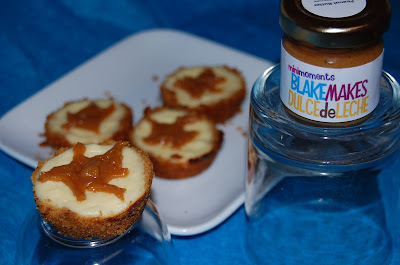 Culinary Infatuation: Bite Sized Cheesecakes and BlakeMakes. 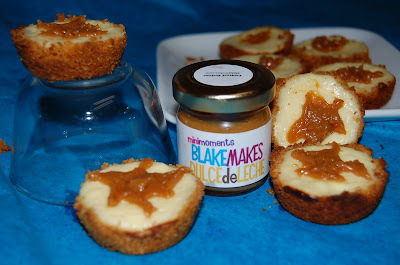 Bite Sized Cheesecakes and BlakeMakes. I recently have encountered a new foodie site, Blake Makes. Blake is from Nola, so I knew I'd like his site immediately. The best thing about BlakeMakes is that he gives away free goodies. Like his very own PBDDL. If you have ever visited, then you know that that acronym stands for Peanut Butter Dulce De Leche and it is TO DIE FOR. I've been a fan of dulce de leche my whole life, and combining it with peanut butter is pure genius. Tonight I decided to highlight his product by making bite sized cheese cakes, a recipe I found on Pinch My Salt. I only received a mini jar of the stuff so I had to make it stretch. The cheesecakes were delicious by themselves, but with the PBDDL, they were even better. Thank you Blake, I can't wait to receive more of your goodies! In a medium bowl, mix graham cracker crumbs, sugar and butter with a fork until well combined. Divide crumb mixture evenly between the 12 cups of your mini-cheesecake pan. Using your fingers (if you don’t have long nails!) press crumbs firmly onto the bottom and partially up the sides of each cup; set aside. Using an electric mixer, blend softened cream cheese, egg, vanilla and sugar together in a medium bowl. Spoon cream cheese mixture into each cup (they will only be half filled). Bake for 14 minutes in a preheated 375 degree oven. Remove from oven and place on rack to cool for 20 minutes then carefully remove cheesecakes from pan and let cool completely. Ally!!!! PB, Cheesecake? Dulce De Leche ALL in ONE dessert??? You have my heart! those look great! Wow. These look soooo good! I'm laughing because as I'm reading this I'm thinking - aww crap, do I have to go out and buy a minicheesecake pan now? And then I saw your last comment. I tried mini cheesecakes before and I didn't have a cheesecake pan or muffin pan. I used the cupcake wrappers instead. This looks delicious. I really want to try some PBDDL! By the way, you made my day! I love reading your blog and I love reading it! Those look awesome! I just used my PBDDL on some cake and it was great too!